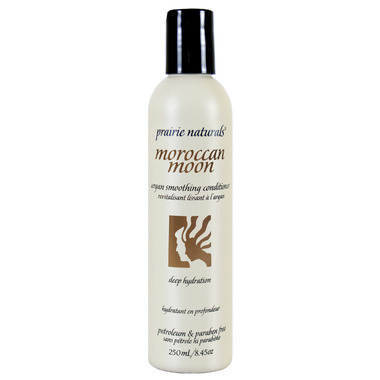 Prairie NATURALS Morrocan Moon Argan Conditioner (and shampoo) noticeably transform your hair from frizzy and fly-away to smooth and silky. Plus it has a wonderful exotic scent of natural ginger and coconut that will lift your spirits while healing your hair. Prairie Naturals Natural Hair Care Products are never tested on animals! They are all made in Canada without the use of phthalates, BPA, parabens, sulfates, DEA, MEA, TEA, petroleum, petrolatum, alcohol, synthetic colours, artificial fragrances. Fantastic product! I also bought the shampoo. My hair was soft and healthy looking. I will purchase this shampoo/conditioner set again.